Be the first to share your favorite memory, photo or story of Vivian. This memorial page is dedicated for family, friends and future generations to celebrate the life of their loved one. 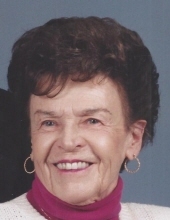 Vivian A. Grom, age 98 years, of Chester, NJ, died Sunday, January 27, 2019, at JFK Hospital, Edison, NJ. Born in Newark, NJ, January 16, 1921, daughter of the late Andrew and Adeline Gardner Gress, she had resided most of her life in Union, NJ, and had resided in Flemington, NJ and Chester, NJ fifteen years. A homemaker, she was pre-deceased by her husband of seventy years, Charles E. Grom, in 2012, and her son-in-law, Gordon Williams, in 2017. She was also predeceased by her two sisters, Constance Maloney and Millicent Craig. Surviving are three sons and daughters-in-law, Charles P. and Patricia Grom, of Chester, NJ; Michael E. and Dorothy Grom of Charlotte, NC; Robert A. and Kim Grom, of Kingwood Township, NJ; a daughter, Joan Linda Williams of South Plainfield, NJ; twelve grandchildren and twenty-one great grandchildren. A Mass of Christian Burial will be celebrated on Saturday, February 2, 2019, at 10 AM in St. Magdalen Church, 105 Mine Street, Flemington, NJ. Entombment will be in Immaculate Conception Mausoleum, Annandale, NJ. Calling hours will be held on Friday, February 1, 2019 from 4-7 PM in the Holcombe-Fisher Funeral Home, 147 Main Street, Flemington, NJ. In lieu of flowers, memorial contributions may be made to St. Jude Children’s Research Hospital, 262 Danny Thomas Place, Memphis, TN 38105. The family would like to thank Dr. Bernie Estellas and staff at NJ Veterans for their care. "Email Address" would like to share the life celebration of Vivian A. Grom. Click on the "link" to go to share a favorite memory or leave a condolence message for the family.